Dy. Chief Engineers: BE/B. Tech in Civil Engineering, Candidate must have minimum 15 years of experience in large infrastructure project execution out of which 5 years should be in Metro line construction for Viaduct I Station I Underground Station I Tunneling with TBMs. He should also have worked at least as Executive Engineer or equivalent for the minimum of 3 years. Candidate must be familiar with Contract Management, QNQC, Safety Implementation, Programme Monitoring etc. for Construction of Civil Structures. Executive Engineers: BE/B. Tech in Civil Engineering + Candidate must have minimum 12 years of experience in large infrastructure project execution out of which 5 years should be in Metro construction for Viaduct I Station I Underground Station I Tunneling with TBMs. He should also have worked at least as Assistant Executive Engineer or equivalent for the minimum of 3 years. Candidate must be familiar with Contract Management, QA/QC, Safety Implementation, Programme Monitoring etc. for Construction of Civil Structures. 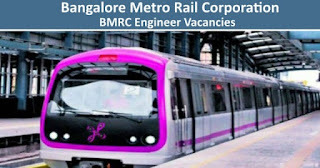 Complete the BMRCL Application Form with the essential data.